"Access to Justice" by Ernestine Ward, Abigail Nurse et al. On February 28, CUA Law’s Black Law Students Association hosted a Civil-Rights roundtable discussion to commemorate Black History Month. The conversation focused on “Access to Justice,” more specifically in relation to Sexual Misconduct/Harassment; Race and National Origin; and Banking and Lending Discrimination. 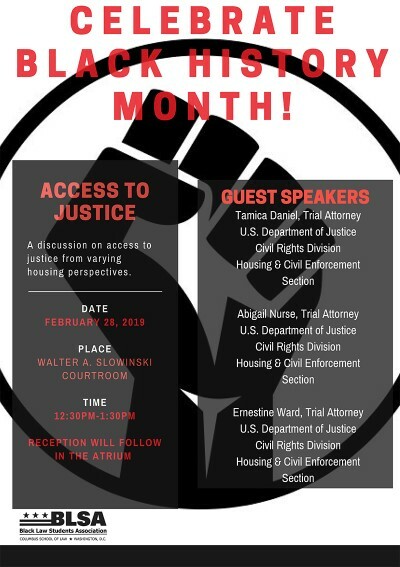 Ward, Ernestine; Nurse, Abigail; and Daniel, Tamica H., "Access to Justice" (2019). Other Lectures & Events. 17.